"The point is this is one of the most important irrevokable economic decisions we will ever make. Let's make it in a state of panic." "The fox is guarding the hen house." Senator Bunning: How long were you CEO of Goldman Sachs? Code Pink woman: And what's your net worth? "I'm not going to fire you; you can still be called Congress. But you don't have any power." "What the proposal actually did...was explicitly rule out any oversight, plus grant immunity from future review... [I]f Paulson can't be honest about what he himself sent to Congress... there is no reason to trust him on anything related to his bailout plan." "If you think the Bailout of All Bailouts...won't saddle American taxpayers with billions, if not trillions, of risky obligations, you don't know politics... Never before in the history of American capitalism has so much been asked of so many for...so few." cannot simply go into a black hole of bad debt." "Americans can no longer trust the economic information they are getting from this Administration... Secretary Paulson's market predictions have been consistently wrong in the last year." "Normally, this is a process that would take months — years." Instead, the law is being worked out, live on television, over the course of a few days. "This is scare tactics to try to do something that's in the private but not the public interest. It's terrible." "Watching Washington rush to throw taxpayer money at Wall Street has been sobering and a little frightening." "Many economists argue that taxpayers ought to get more than avoidance of the apocalypse for their dollars: they ought to get an ownership stake in the companies on the receiving end." "Seriously, is there anybody out there willing to write George Bush a blank check?" — Dennis Kucinich, proposing Americans should also take partial ownership of any institutions receiving bailout money. I think it's embarrassing to the United States of America. There is a lot of blame to go around." "For anybody out there living in cave, let me just say this. Congratulations. You've apparently made the soundest real estate investment possible." Can Senator Lieberman Be Recalled? One of these is not like the others. I’m looking at Gingrich. Fire the CEO and Board Member’s that got them into this predicament! @Common_Sense: Fire them? Screw that: Jail Them! Anyone who oversaw this disaster should be jaled for fiddling while the financial markets burned. It’s time to admit that the current, opaque free market will always find a way to screw the little guys, and to build accountability and transparency in at every level so this crap doesn’t happen again. Mind you, that’s what was said last time this happened and nothing of any real worth was done, hence we repeat the mistakes we failed to learn from. With the Wall Street Bailout of 2008, I feel we are only postponing a serious depression. You cannot change some individuals’ basic greed and dishonesty and this situation will happen again and again if we don’t say ‘NO’ this time. There are never serious reprecussions for these types of white collar crimes in America and everyone in power right now in Washington has a hand in this catastrophe. Every single one of them should be voted out at the next opportunity. The American taxpayers are being laughed at by these crooks! Get smart, people, and stop being so naive and trusting. Thank you for your interest in US Treasury products. Due to unusually high call volume, your order for US Treasury products cannot be completed at this time. For your protection, your IP address has been logged and account information forwarded to the US Dept of Homeland Security. Thank you for calling the US Treasury. CURIOUS……..IF McCAIN AND OBAMA CAN’T AGREE ON ANYTHING… HOW IS IT THAT WHEN IT COMES TO $ (700 BIL) THEY ARE ON THE SAME PAGE??? WHAT IS THEIR CUT FOR “NODDING”??? They violate the 1st Amendment by opening mail, caging demonstrators and banning books like “America Deceived” from Amazon, Wikipedia and Facebook. I have a question….how can the Congress pass a bill for the bailout of 700 billion dollars of our tax money without our permission? I do not want to give my hard earned tax money to these SHARKS ON WALL STREET. When we make a mistake we pay for it…..WHY NOT THEM? I’m sure, like me, you’re drowning in reports, debates, opinions, treatises, articles and sound bites about recent events on Wall Street. While most of these data bits and opinion pieces have focused on issues of financials, credit, “paper”, mortgages, housing, greed, and the like, what shouts out at me is a deeper issue – that of a systemic breakdown in relationships and an erosion of trust. There was a time when, for example, obtaining a loan was processed between two individuals, one’s banker and one’s self and resulted in a long-term relationship characterized by deep long-term bonds based on a deeper relationship, a relationship that fostered trust, openness, transparency and honesty. Over time, this “relationship” has morphed into a fragmented process which includes numerous individuals and often the individual with whom one first spoke is no longer in the mix. In essence, the “relationship” has now become a “transaction.” The “relationship” has now become a complex series of disjointed “connections” with numerous players – each of whom is seen as a “function”, as opposed to a real, flesh-and-blood human. A flavor of what has been happening on Wall Street is also happening on Main Street, namely, the dynamic we have come to know as “relationship” is quickly disintegrating and being replaced by another dynamic called a “connection” between, for example, a spouse and their partner, a parent and their child, and between lover and lover – a transaction or “connection” that most often is separated by distance. The “new relationship” on Wall Street and Main Street is a more superficial one, defined by “connecting” through an email, iPhone, Blackberry, Twitter, Linkedin, MySpace, fax, etc. – an electronic “connection” devoid of any “personal-ness.” Personally and professionally – at work, at home and at play – folks are becoming more and more dis-connected and distant. As these relationships have become more impersonal, with limited face-to-face interaction, an all-important emotional connection is lost, and with that loss, trust erodes. In this depersonalization, when trust erodes, untrustworthy behavior fills the void. Healthy, conscious relationships that exude openness and trust can only be cultivated when and where all parties experience an emotional “safe zone”. As relationships are replaced by “electronic” interactions and transactions, emotional connection, the “human factor” — the “secret sauce” that defines and creates true and real relationships —erodes. In addition, as relationships erode, and as trust erodes, so does friendship, the one element that marriage researcher John Gottman says is the definitive foundational element that determines, for example, the sustainability of relationships. When there is no emotional connection, there is no friendship. No friendship, no trust. No trust, no honesty, no transparency, no truth-telling. The “ethers” through which electronic connections are made today – with our banks, with other businesses, with our loved ones, with our friends and colleagues – cannot create this safe zone. Electronic connections do not and cannot create an emotional trustworthiness. Thus, the one major unintended consequence of “separation by electronics” is the erosion of trust. The reality is within this electronic, “transactional” world, what is happening is that more and more folks may be “connecting”; however, fewer and fewer folks are “relating.” We might live in an increasingly interconnected world, but we are living less and less involved in an “interrelated” world. Thus, we are experiencing the fragmentation of relationships at work, at home and at play – one major consequence of living in an electronically-connected world. The disintegrating relationships on Wall Street and Main Street are simply symptomatic of a greater threat and challenge we face today – where increasingly we are living in a world of increasing interconnecting and decreasing interrelating. ·	Do you deal with your internal/external clients personally after the initial contact, or do you hand them off to others? Are you available to them personally if they want to contact you later on? ·	Do you ever view colleagues, co-workers and clients as irritants? How about your children? Do you ever view them as irritants? Do you prefer to “connect” with them at an “arm’s distance”? ·	What is your preferred mode of communicating at work? In person or by electronic device (even when in-person is very do-able)? With you family during the day? ·	How would you describe the nature of your relationships at work, at home and in friendships: connecting or relating? What would others say about how you relate? ·	Do you have trust issues with folks at work, at home and/or at play? ·	Are you usually physically available when folks need you? Emotionally available? ·	How many chairs in your home actually face one another? How often do you have face-to-face conversations with each other as opposed to snippets sitting side by side while watching TV, or reading the paper or some business document, etc.? ·	When you and your family sit down for meals, is the cell phone also a require utensil? ·	When you have meals with your children at home, or out, do they spend more time looking at some electronic device than they do being engaged in meaningful conversation with you and each other? What about you? Is your cell phone an added part of your dining experience? ·	Does your spouse, partner or child ever remark that, in some way, shape or form, you feel distant to them? ·	Would others describe you as superficial, “cold” or “unapproachable”? How do you know? Would you consider asking them? ·	Do your children have social challenges when relating to others, when relating to you? ·	How many hours of watching TV, or playing electronic games, or being on the Internet do you and your children engage in every week? Do you care? It that important to know? ·	Are you ever lonely? ·	(c) 2008, Peter G. Vajda, Ph.D. and SpiritHeart. All rights in all media reserved. So, they want us to bail out the billionaires. Where was the bailout for the citizens living in New Orleans? Where was the bailout for the citizens who lost (and are still losing) their homes? This adminstration has looted the non-wealthy for the benefit of the wealthy every way it could. Enough! No bailouts for billionaires! Let their precious free market handle it. 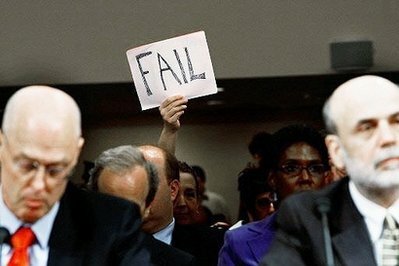 Now that the Senate has passed the 700 billon bailout has McCains destiny been sealed? Two years later, the truth comes out. The government got all of its bail-out money back, with an 8.2% profit. They actually earned the taxpayers an extra $25.2 billion. These figures aren’t from some fringe web site. It’s Bloomberg News. They reported that the bailout “provided taxpayers with higher returns than they could have made buying 30-year Treasury bonds — enough money to fund the Securities and Exchange Commission for the next two decades. That makes it so weird reading this now, knowing how it all comes out. The public has been lied to so shamelessly and so often in the course of the past four years that the failure to tell the truth to the general populace has become a kind of baked-in, official feature of the financial rescue. Money wasn’t the only thing the government gave Wall Street – it also conferred the right to hide the truth from the rest of us. And it was all done in the name of helping regular people and creating jobs.